This illustrated companion to the popular podcast and National Geographic Channel show is an eye-opening journey for anyone curious about our universe, space, astronomy and the complexities of the cosmos. For decades, beloved astrophysicist Neil deGrasse Tyson has interpreted science with a combination of brainpower and charm that resonates with fans everywhere. This pioneering, provocative book brings together the best of StarTalk, his beloved podcast and television show devoted to solving the most confounding mysteries of Earth, space, and what it means to be human. 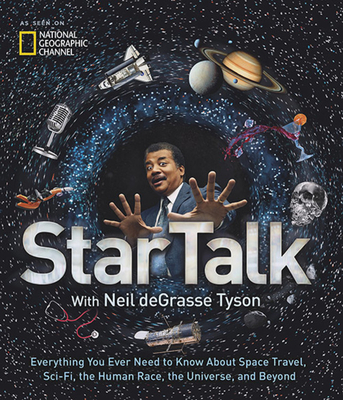 Filled with brilliant sidebars, vivid photography, and unforgettable quotes from Tyson and his brilliant cohort of science and entertainment luminaries, StarTalk will help answer all of your most pressing questions about our world—from how the brain works to the physics of comic book superheroes. Fun, smart, and laugh-out-loud funny, this book is the perfect guide to everything you ever wanted to know about the universe—and beyond. NEIL DEGRASSE TYSON earned his BA in physics from Harvard and his PhD in astrophysics from Columbia. His professional research interests are broad and include star formation, exploding stars, dwarf galaxies, and the structures of our Milky Way. Tyson was appointed by President Bush in 2001 and 2004 to serve on committees studying the Future of the U.S. Aerospace Industry (published in 2002) and the Implementation of the United States Space Exploration Policy. He has also served on the Advisory Council for NASA. He is a monthly essayist for Natural History magazine and has published nine books, including the best-selling Death By Black Hole: And Other Cosmic Quandaries. He also is the first occupant of the Fredrick P. Rose Directorship of the Hayden Planetarium. Tyson lives in New York City with his wife and two children. CHARLES LIU is an astrophysics professor at the City University of New York’s College of Staten Island, and an associate with the Hayden Planetarium and Department of Astrophysics at the American Museum of Natural History in New York. His research focuses on colliding galaxies, quasars, and the star formation history of the Universe. He earned degrees from Harvard University and the University of Arizona, and held postdoctoral positions at Kitt Peak National Observatory and at Columbia University. Together with co-authors Robert Irion and Neil Tyson, he received the 2001 American Institute of Physics Science Writing Award for his book “One Universe: At Home In The Cosmos.” More recently, he is the author of “The Handy Astronomy Answer Book,” now in its third edition. He and his wife, who is way smarter than he is, have three children who are also way smarter than he is. JEFFREY LEE SIMONS is the social media director of StarTalk Radio. When he’s not busy engaging with the greatest fans in the universe, he’s also a writer. He is the author of Spirit In Realtime, the first installment of his near-future, virtual reality/cyberpunk young adult science fiction series. Jeffrey is also the co-author of the cause-related marketing handbook, Making Money While Making A Difference, with Dr. Richard Steckel, and the author of two works with noted artist Viktor Koen: Lexicon: words and images of strange and Toyphabet. He has a BA in Literature from Georgetown University. He lives in New Jersey with his wife, daughter, and four cats.